InstaGC Review: Does InstaGC Work? Last updated on January 21, 2019 By Nat Leave a Comment This post may contain affiliate links. We appreciate you supporting Rags To Niches! Full disclosure here. What is InstaGC – does it really work? Or is this just a giant scam? Hey there and welcome to my in depth InstaGC review today. This website can be bundled into the online-survey category, or you may also know it as a GPT site, (or get-paid-to). GPT sites offer more than just surveys – but have multiple ways you can make money. You can earn money by completing a variety of tasks online, including paid surveys, watching videos and completing offers. These guys have been around for a decent chunk of time online, founded in 2011. But longevity does not automatically mean that they’re good. I’ve reviewed hundreds of opportunities online and many of them share a lot of similar issues, which I will discuss today too. But… do they provide you with an opportunity to make money? That’s what you want to know – right? Great, then let’s get stared. Vedict: Legit – one of the better sites like this I’ve come across. I found the website easy and clean to navigate and there were a good amount of providers to choose from. Related: Top 10 Survey Sites USA & Top 10 UK. Signing up was really quick to do here, you just need your name/username and email address. You don’t have to provide them with your address at ths point. From there, you can see everything that is available. I liked the clean layout of the website and it was simple to navigate, without too much going on. From the main page, you can see a photographic list of all the providers that participate here. some of those included were; Offer Torro, Peanut labs, Crowd Flower and Video Loyalty. This platform works on a points system. In the US 100 points = $1. In the UK 160 points = £1. Points value are going to vary depending on your country and you can check on this one you’ve signed up. You can choose from a variety of gift cards to pay out, but you need to have more saved up to use other payout methods. Such as $50 for Paypal, ($25 after your first initial transaction, (which seems very high). This is one of the most popular ways to earn online, but also one of the hardest and can be very time consuming for a minor amount of money. I did an experiment where I tried to qualify for a survey and it wasn’t until the 6th one that I finally managed to qualify, (scroll down to see my results). This is extremely common and not a problem with InstaGC, but just a problem with all survey websites. Related Post: My Top Extra Income Sites! You can earn points for downloading certain games, or apps. This could include a large variety – for example I saw; there were dating apps, various casino type apps and various games, (such as Final Fantasy XV). Points per app varied from 8 points, to almost 1000 points. Exactly like Swagbucks, you are able to surf the web using their search engine and then randomly you may get allocated points. However, you can’t access this right away – either you, or someone you refer, has to have completed a task within the previous 5 days. But they had no offers available for me, not with any of the providers. So, I presumed maybe that’s my location. If it was pay-to-click though, that’s where you earn fractions of a cent for clicking on Ads and isn’t something that I recommend. Where you can earn receive points from shopping at certain stores, this works in the same way as cashback. This is a section where you can be paid for signing up to trials of products. You can also be paid for tasks, which may include something like: downloading a particular software, or entering a sweepstake. A really good aspect of this platform, is the low pay-out limit. So, you can exchange your points for a gift card, just as soon as you reach $1, or £1. There are a large number of gift cards available that you can choose from. One of the most popular choices will be an Amazon gift card, but if you’d rather something else, there is quite a selection – including large chain stores and restaurants. I decided to try out some surveys for myself. The initial survey I tried was via peanut labs and right away it said I wasn’t a match. This was straight after my profile survey and it was quick, but I didn’t mind. The next one was via peanut lab, but I was sent off to “your-surveys,” (another survey site). It said I was eligible for a survey, but a few questions in, it chucked me off! I can’t work out what I could have said to get me thrown off it either. The next one I quickly didn’t qualify for either, as I would have had to provide some car info that I didn’t have. 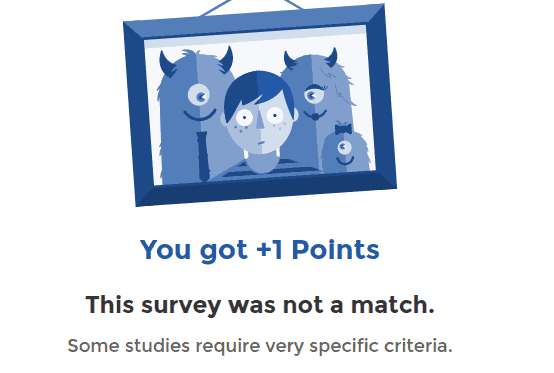 For each survey I didn’t qualify for via peanut labs, I got awarded 1 point. Which, obviously isn’t much at all but better than zero. 4th time lucky? I was invited to Opinion Inn to try out one of their questionnaires. The next one I got thrown off of as well – I was only a few questions in this time, but it is seriously getting boring. No. 5 … thrown off. I was told I’d get 59 points for 18 minutes. Although, it took around 25 minutes for me. The survey was was all about an up and coming kids film, which was quite an enjoyable survey, as surveys go. What I will say is, that in order to not be disqualified you have to be SO careful with your answers! The questions are designed to notice any subtle inconsistencies in your answers. Therefore, it will ask you exactly the same question in various ways… you need to remember what you have said previously and not just make it up, otherwise you will be thrown off. 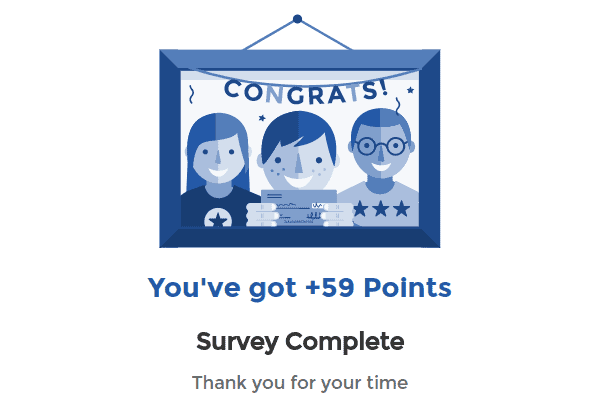 So, 59 points for about half an hour of my time completing a really dull survey… was it worth it? Well, if I have to make up 125 points for a single pound, I’d have to do more than another one of those to get there. That’s not including, all the time it took me to actually get to a survey that I could do!! This happened to me when I was reviewing superpay.me – I didn’t manage to qualify for a survey. I think I went through 7 or so surveys that I didn’t qualify for and only qualified on the 6th one here. After I completed this survey, I then tried to qualify for around FIVE more and had zero luck. The only thing I can say is that I was disqualified very quickly and didn’t have to waste too much time, (which is so often the case). You can just imagine how much time you’d have to spend on surveys to make anything worthwhile at all. It’s just crazy. With these sorts of sites, the best bets will always be the paid OFFERS! At least with those, you just fill out your details usually and that’s it. Although, some others require you to complete at least one survey there before you’re awarded. InstaGC actually has a pretty good reputation online. They don’t have tonnes of angry people leaving negative complaints. Although, I am surprised that MORE people don’t complain about not qualifying for surveys. It’s a general complaint I see all the time for survey sites. I noticed that InstaGC are quite active in responding to any negative comments and also trying to resolve any issues that people have. Having negative customer service issues. Their accounts becoming locked, (but apparently this is normal prior to cashing out – they block your account until they can verify your identity and may ask for proof). Low pay, (well, you won’t get paid much on these sites!). 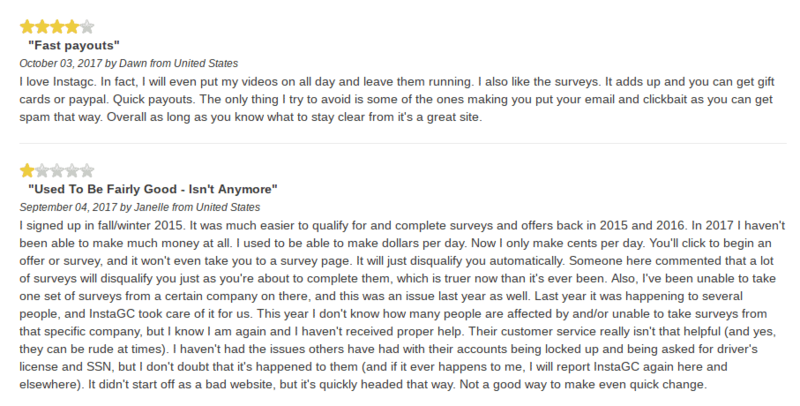 Getting disqualified for surveys, (again, happens with any survey site! You should also remember, that if they have reason to feel you are somehow deceiving them in order to gain rewards, they are able to close your account without warning. Clean and professional looking website. Instant payments – no waiting for weeks like some sites! High payout for paypal, ($50 for initial withdrawal). With so many providers, you are sent outside the site often and therefore, have to sign up with other companies and provide the same-old information time after time. Not just a problem with InstGC – but you will be thrown off of surveys, often! Is InstaGC Legit? Or Is It Just A Time Wasting Scam? Well, I think I’ve demonstrated that you can make a small amount of money here. The important thing to realise with things like this is, you’re NOT going to make tonnes of cash doing these kinds of tasks. At most you get a little pocket money, or you can save up your points throughout the year and then use them for a evening out, or Birthday. Unfortunately, some sites out there will inform you wrongly that you can make hundreds or thousands of dollars a month on sites like this. Mainly, that you have to often give out your credit card information and there is a risk that you’ll end up paying out if you’re not extremely careful to cancel memberships and trial before the allotted time! If you do it too late, you end up being worse off than when you started. Ultimately, if you’re looking to make real money online in the long term, this is not the way you do it! There are lots of legitimate ways to make money online, but ALL of them do require work on your part. But then, the amount of work it took just to make that 59 points… I mean, that was effort in itself and all for next to nothing!! That’s why I came online… to see how I could build up an income for myself. I make the most online from having my own blog/website and make money in a variety of ways. If you’d like to learn how you can create a long-term income online, I recommend the free training here. That concludes my InstaGC review for now…. Is there anything you’d like to share about InstaGC, or other related sites? Let me know in the comments!